Iron Maiden and Avenged Sevenfold topped the winners list at this year's Metal Hammer Golden Gods Awards in association with World Of Tanks – while Orphaned Land shared their award in support of middle-east peace efforts. The gala event was presented in London last night (Monday) by Steel Panther, who headlined the show after sets from Black Stone Cherry, The Dillinger Escape Plan, While She Sleeps and Behemoth. The indigo2 ceremony came after a traditional voyage up the Thames aboard Vans HMS Hammer, where Orange Goblin, Kill Devil Hill, Dyin Fetus, Thy Art Is Murder and Hounds played for 200 competition-winning guests and VIPs. Maiden were named Best UK Act while A7X took home Best International Act. Israeli outfit Orphaned Land opted to split the Global Metal Act award with Palestinians Khalas – a gesture proudly supported by Metal Hammer and the Golden Gods. Other winners included Periphery guitarist Misha Mansoor, Killswitch Engage, Hanoi Rocks, Opeth’s Mikael Akerfeldt and many others. Editor-in-chief Alexander Milas said last night: “Heavy metal has been around for over 40 years, and as this year’s winners prove, it remains as vibrant as ever. “From prog metal visionaries Opeth, genuine guitar hero Michael Schenker, absolute legends Hanoi Rocks – who first married the words ‘glam’ and ‘metal’ and inspired a movement – to Orphaned Land, whose integrity as artists and spokespeople for the power of metal to unite people genuinely blew us all away tonight, this was a night for the history books. 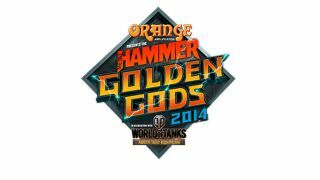 Metal Hammer provides full live coverage of the Golden Gods evening via the links below.